The new Batman movie "The Dark Knight" smashed the weekend record set by "Spider-Man 3" last year, selling an estimated $155.3 million worth of tickets during its first three days of release across North America. The Caped Crusader also generated $40 million from 20 foreign markets. 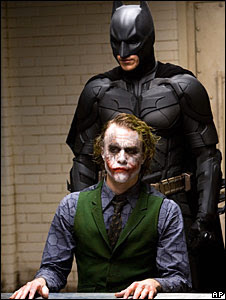 More recently, "The Dark Knight" was the number-one movie for the second week in a row, raking in $75.6 million. The Dark Knight' has just become the first movie ever to gross $300 million in its first 10 days, beating 2006's Pirates of the Caribbean: Dead Man's Chest, which took 16 days. Warner Bros. head of distribution Dan Fellman is anticipating that The Dark Knight will reach the $400-million mark in 18 days -- topping over 2004's Shrek 2, which took 43. If The Dark Knight keeps this up, chances are it'll surpass 1997's Oscar-winning massive epic Titanic, which still holds the record as the highest-grossing film of all time at $600 million dollars domestically.